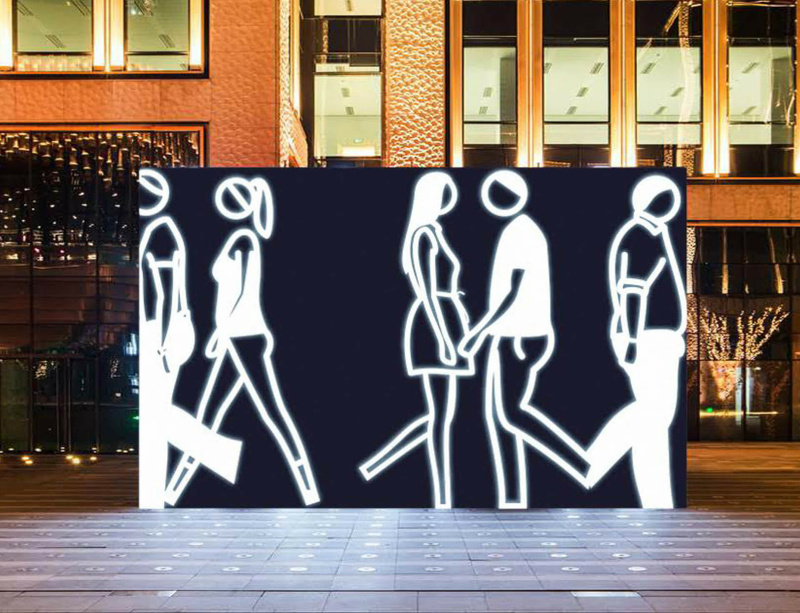 Lisson Gallery, in collaboration with Fosun Foundation, will bring the first major solo exhibition by British artist Julian Opie to China. Opening in March 2017, the exhibition will be the held at the new Fosun Foundation building, co-designed by Foster + Partners and Heatherwick Studio, located in the Bund Financial Centre (BFC) in Shanghai. The exhibition will cover two floors of the Foundation and will feature over 50 works, many made especially for the exhibition, including paintings, sculptures, mosaics, tapestries, wall drawings and LED and LCD films. Always exploring different techniques, Opie plays with ways of seeing through reinterpreting the vocabulary of everyday life; his reductive style evokes both a visual and spatial experience of the world around us.Taking influence from classical portraiture, Egyptian hieroglyphs and Japanese woodblock prints, as well as public signage, information boards and traffic signs, the artist connects the clean visual language of modern life, with the fundamentals of art history. More information on the exhibition will be announced in 2017.